The following questions were asked on reading textbook chapters and previewing presentations on optical instruments. "The two-lens ray tracing models, where the image from the first lens affects the image in the second lens. It wouldn’t make sense for these two to be separate entities, and this seems pretty straightforward." "Angular size is the measure of how big something seems from your viewpoint. Angular magnification is the measure of how much larger the angular size of an object seems through a magnifier rather than with your naked eye. 25 cm is the near point, or the nominal closest distance an unaided eye can focus on." "The difference between a telescope and a microscope. They both serve to make a object the right magnification for observation by the human eye, but do so in very different ways." "There are various similarities between microscopes and telescopes, such as they both have focal objective lenses and eyepiece lenses to see the image. The similarities and differences also lie in the ray tracings, which I kind of don't understand." "The distinction between ray tracings for microscopes and telescopes made sense to me. Being able to visualize it in the presentation helped. For microscopes the object is closer to the focal point and for telescopes it is really far away." "Microscope and telescope both have two lenses. The objective takes the light from object, and creates a real image that becomes the object 2 for the eyepiece." "Microscopes and telescopes both use converging lenses to make an object appear bigger but they differ in length in order to make a really small object seem big or a really far object seem close." 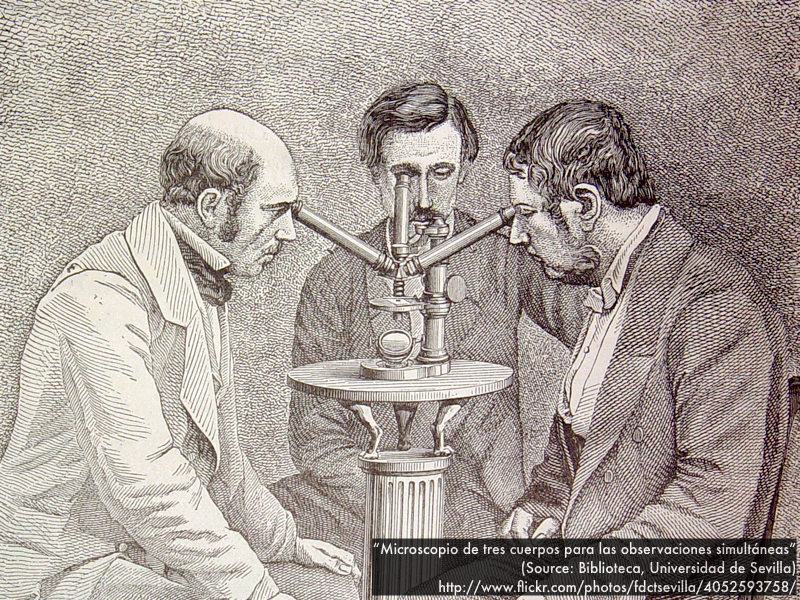 "For a microscope objective the object is placed close to the focal point and thus gives a very enlarged image. For a telescope objective the object is very far away, producing incoming rays that are essentially parallel." "I will need some in class help with the new equations for microscope magnification and telescope magnification." "The difference between microscopes and telescopes are a little difficult. I’ve had difficulty with ray tracings so I need more explanation on that." 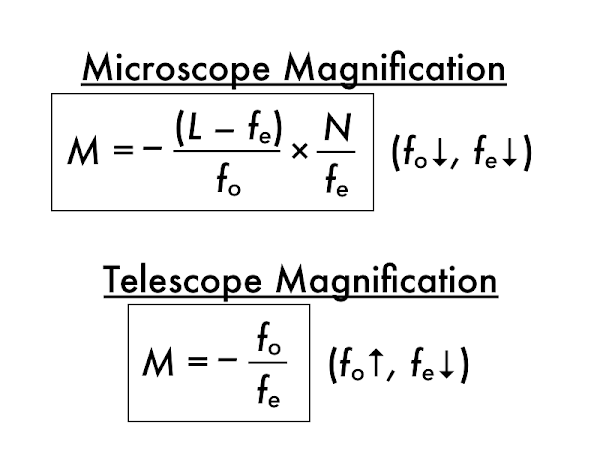 "Since we are now studying angular magnification of compound microscopes, telescopes, and magnifying glasses we have to use different types of angular magnifications for each scenario. I am really confused as to use which equation for which scenario. I feel that if we go over some examples in class I'll have a better idea but right now I don't quite get it." "I don't understand the microscope ray tracings and what they mean--definitely need help with that." "I don't understand how the image from the objective becomes the object for the eyepiece." "I'm having some trouble understanding the telescope eyepiece as well as the microscope eyepiece. This may however just be because I need some review on magnifications." A (compound) microscope should have a __________ focal length objective lens and a ___________ focal length eyepiece lens in order to maximize its angular magnification. 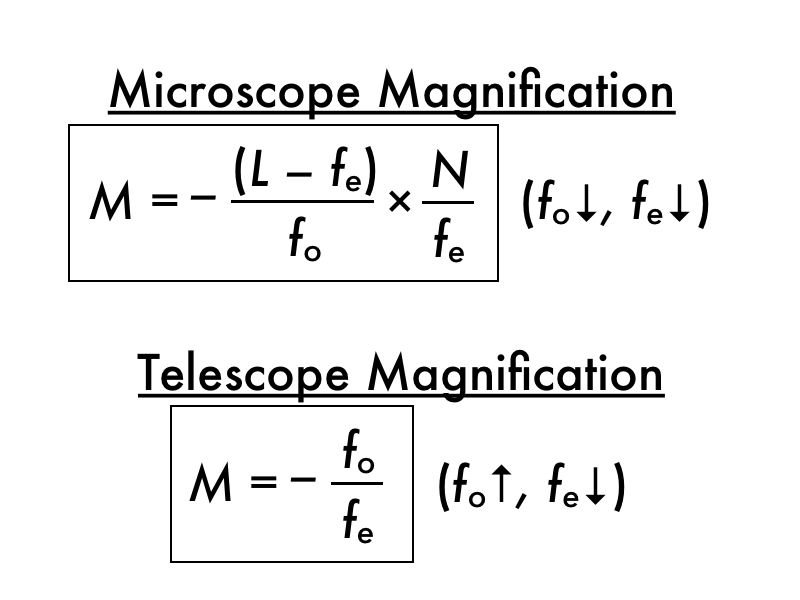 A telescope should have a __________ focal length objective lens and a ___________ focal length eyepiece lens in order to maximize its angular magnification. "Can we do some examples of these angular magnification scenarios during class?" "Can you please discuss more about angular magnification in respect to microscopes and telescopes?" "I liked the optometry lesson the other day."